Hong Kong is used to fierce storms, but when Typhoon Mangkhut struck the city on Sunday, it soon became clear that this one was different. Wind gusts as strong as 160 miles an hour swept through the city, rocking tall buildings and fueling storm swells that threatened the coastline with waves as high as 40 feet. At midday, the city’s normally teeming streets were devoid of people and cars. The weather authority issued its highest typhoon warning, a signal 10. The government also issued a landslide warning, urging people to stay away from steep hills and retaining walls and asking residents in vulnerable areas to evacuate. And for the first time ever, Macau, the Asian gambling capital farther along the Chinese coast, closed its casinos because of a storm. Hong Kong residents hunkered down in their apartments, having cleared many grocery store shelves the day before in preparation. Others took refuge in shelters. The city’s airport, a central transit point for much of Asia, was virtually shut down, with almost 900 flights canceled. The outdoor sections of Hong Kong’s vaunted subway system were taken out of service. In Mong Kok, a crane collapsed at a construction site, but no injuries were reported. Hong Kongers took to Facebook and WhatsApp messaging groups, circulating pictures of the hurried preparations: cars and motorcycles mummified with cling wrap, indoor storefronts encased with spiderweb-like tape. One Instagram user altered an image to add Spider-Man onto the side of a Hong Kong building, where he’d pitched in by putting tape on a window. 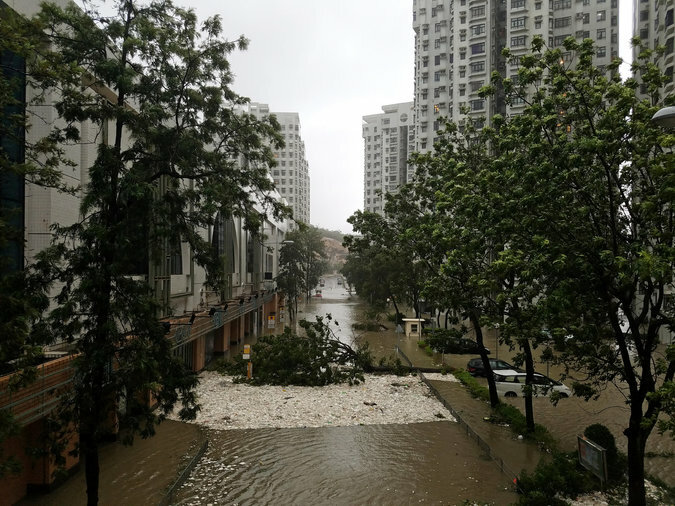 Typhoon Mangkhut struck Hong Kong on Sunday with winds of up to 160 miles an hour. But as the storm bore down in full force, the postings became more ominous. In a city of towering apartment buildings, some reported they were becoming motion-sick as their homes twisted and swayed. Videos showed glass windows and doors smashing, pedestrians being blown off the ground and residents frantically scooping rain out of their balconies to prevent flooding. A NASA satellite captured the intense rainfall of 2018’s strongest storm so far. 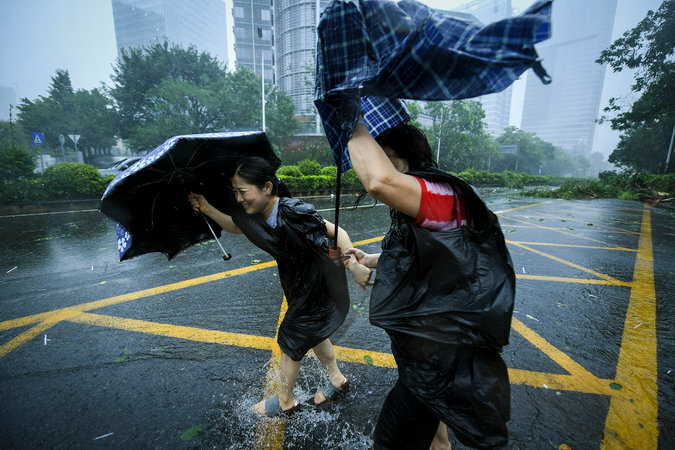 Braving the storm in Shenzhen, China, on Sunday. Storm radar also showed the typhoon battering Guangdong Province, just across the Hong Kong border in mainland China. High-speed rail service was suspended in the province, and workers took precautionary measures at two nuclear plants along the coastline. Guangdong, China’s most populous province, has extensive experience with typhoons, and makes elaborate preparations for each of them. Evacuations of low-lying areas are mandatory. Fishing vessels are ordered into well-protected anchorages. After 16 workers were killed when their shanty collapsed in a typhoon in 2003, the province pursued a strenuous campaign of demolishing or upgrading substandard housing.